Have you ever helped a witness get up to speed, or interviewed a witness who seemed all put together, only to see him or her take the stand and unravel? For example, had Mark Fuhrman been able to appropriately acknowledge his regrettable actions of the past in the O.J. Simpson criminal trial, how many days of courtroom drama would we have been spared? Recent high-profile cases suggest the need to rethink basic assumptions about witness preparation – to, in effect, probe the essentials of this fine art more deeply than is encouraged in most litigation skills training. Witness Prep Level 1: Surface, which includes observable outward appearance, demeanor, body language, and delivery of verbal testimony. Witness Prep Level 2: Subsurface, which includes the emotional/ personal/professional conflicts that act as an undercurrent to the surface level. 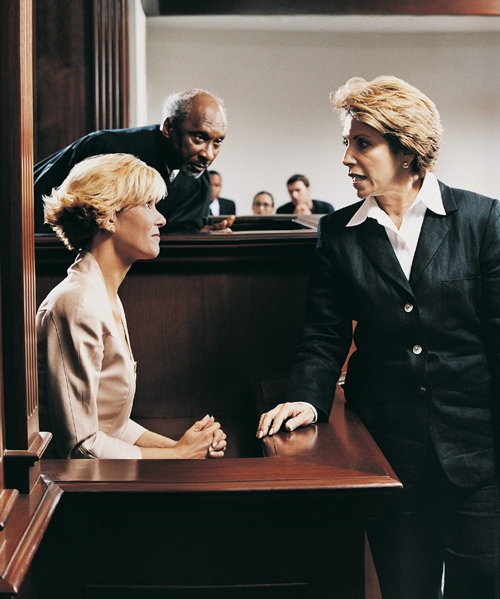 Many practitioners (lawyers and others) attempt to modify the exterior aspects of witness testimony (i.e., the surface level) by rehearsing the “correct” responses with witnesses, admonishing them about incorrect responses, and telling them how or how not to look (i.e., cosmetic fixes). It is common to discuss the selection of the appropriate suit and tie for a male witness or the right style of dress and accessories for a female witness. It is also common to provide witnesses with lawyer-generated outlines or scripted responses for Q & A sessions, and to ask them to study and internalize the scripts. Efforts of this type require witnesses to perceive, attend to, comprehend, store and recall information. In other words, they must use their perceptual and cognitive abilities. However, traditional witness preparation tends to yield unreliable results because it is superficial and does not address subsurface conflict. For example, we have often heard counsel advise a witness, “Don’t worry about this particular issue in your testimony,” without knowing what the witness actually does have to worry about. Progress made through surface-level preparation alone is transient and highly susceptible to being reversed in the absence of constant reinforcement. Conflict tends to undermine surface-level preparation because it interferes with the perceptual and cognitive skills involved in processing and recalling the information. Distractions or emotional concerns may cause the witness to simply forget the answer due to limited recall of the “correct” response when under pressure. Second, even when the witness recalls the “correct” response, the delivery can unwittingly communicate unaddressed, underlying discomfort or conflict and betray the intended message. In other words, the delivery (through intonation, choice of words, facial expression, body language, posture and eye contact) can sabotage the response (for example, when the mouth says “no” but the head nods yes). Finally, since rote feeding of responses cannot predict every possible question, it cannot supply every possible answer. The witness may progressively fail to hold up under attack on cross examination because he or she does not know the prescribed response to an unanticipated question. If, in the face of the unexpected, a witness senses that they’ve lost control, it will throw them off track and into a tailspin. The inability to predict every possible question and thus to model every possible response for the witness. The fact that, in some way that relates to the case or the experience of testifying, the witness is conflicted. Such conflict tends to undermine surface level preparation because it interferes with the perceptual and cognitive skills involved in processing and recalling the information necessary for effective witness performance. In addition to pondering and reviewing legal or technical facts, almost every witness is likewise preoccupied by internal and personal issues. These may pertain to his or her real or imagined vulnerabilities, may or may not be case-related, and may be known or unknown to the trial team. Usually they are unknown. For example, there was “the man who bent over backwards,” a caring, hardworking disaster-claims adjuster with an impeccable professional record who had an extramarital affair during a claim assignment. The handling of that claim later became the issue of a lawsuit. The adjuster’s diligence might be a positive issue under cross, but because of his affair (not the work he had done), he experienced great angst while preparing to testify. The consequences of being exposed threatened to undermine his testimony. It was only by bringing the issue of his affair to light, discussing possible consequences and solutions, and reconciling them in the context of the case that the witness was able to cope with it. Once free of his dark secret, he was prepared to assert affirmative points, focus on his proper handling of the disputed claim, and present himself with dignity. In fact, further dialogue revealed that, in some instances, his on-the-road relationship may have actually benefited the insured because he had offered extra assistance to his coworker paramour (crawling into difficult-to-reach inspection sites, for example), which he would not have done had they not been so close. The sources of conflict are typically not cognitive, but emotional or personal in origin. Since one’s emotional state affects perception and memory as well as overall competence and performance, it is risky to engage in preparing a witness on the surface level until the covert, subsurface-level issues are addressed first and fully. The conflicts must be explored, revealed and resolved before a witness can come to a state of optimal competence and reliable performance in which he or she is fully able to process and handle information. During typical preparation sessions, witnesses are unlikely to voluntarily bring their personal conflicts and concerns to the surface and reveal them to the trial team, either because they are unaware of the conflicts themselves or because they experience shame, regret, dread of repercussion, or self-recrimination. This is particularly so for expert witnesses who often fancy themselves (or believe others should see them) as invincible. Admitting a problem could shatter that image. The goal is to prepare a witness to be conflict-free. The term “conflict-free” does not mean “problem-free,” in which witnesses would be reassured by simply playing down the challenges to overcome in the testimony. Instead, it means a witness free of unaddressed emotional dread about undisclosed issues. Internal conflict is fueled by anxiety and is then unwittingly disclosed on the stand in a variety of self-defeating behaviors. These include defensive preempting of, or sparring with, the cross-examiner; anticipating questions; interrupting the examiner; becoming antagonistic; misstating known facts; failing to recall memorable facts; or contradicting prior testimony. Exploring and addressing internal personal fears by providing concrete coping strategies and helping to reframe issues. It is not necessarily a “bad fact” that undermines a witness; rather, it is how the witness views and reacts to the bad fact that determines his or her credibility and durability as a witness. One senior engineer had a habit of jotting down highly provocative and inflammatory comments in the margins of his company’s internal memos. In a lawsuit years later, he was terrified those notations would come back to haunt him. The day was won by shifting his focus from the notations to his behavior, and by getting him to acknowledge outright that he had a bad habit of writing “cockamamie” things which were immature, impudent, and intended to get a rise out of his superiors, but which did not relate to the plaintiff’s allegations of fraud. Establish rapport and trust. Ask fundamental questions that show concern for witnesses. Who are they outside the context of the case? What are their family histories and backgrounds? Place in birth order? Role in family, role in business, role in the case? How has all of this affected their personal and professional lives? What makes them angry or worried or upset? What is the best and worst outcome they could expect? How do they feel about the possible consequences? What is their prior experience testifying? What from that experience still applies? What’s different now? What, if anything, do they regret regarding this case? How, if at all, can it be remedied? What would they have done differently if they knew then what they know now? Maximizing contact between the witness and the trial team helps to maintain the established rapport and sends a message to the witness that the trial team is receptive and values their participation. Individuals such as junior or lower level associates and staff who are capable of building rapport with witnesses can act as communications liaisons between witnesses and senior members of the trial team. Such liaisons are commonly more accessible and less threatening. Witnesses are apt to ask them questions or express concerns to them. These contacts can be especially valuable during the pretrial countdown days when what the witness considers important can be superseded by the trial team’s priorities. Empower the witness with knowledge. Even a seasoned professional can be reassured by a review of fundamentals and details of what is expected in an upcoming procedure (whether deposition, hearing or trial). Make sure witnesses are kept up to date regarding the status of the trial and changes that may impact the order and substance of their testimony. The communications liaisons discussed above can assure that witnesses are continually apprised of developments. Address areas of conflict and provide coping strategies. Particularly troublesome witnesses who have difficult dispositions, attitudes, and/or substantive problems can be significantly aided with the help of professionals. In sum: To present a witness who is well-prepared, it is vital to reveal and remove conflicts which, like hidden land mines, can cause irreversible damage. Who is a Litigation Consultant?